Mistaking or assuming peoples' pronouns without asking first, mistakes their gender and sends a harmful message. Using someone's correct gender pronouns is one of the most basic ways to show your respect for their identity. 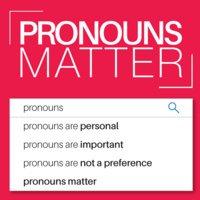 Join the LGBT Resource Center during International Pronouns Day to advance the knowledge of using everyone's correct gender pronouns and strive for a more inclusive environment at UCSF. We will be tabling at the locations listed below and sharing more information about the Pronouns Matter Campaign.